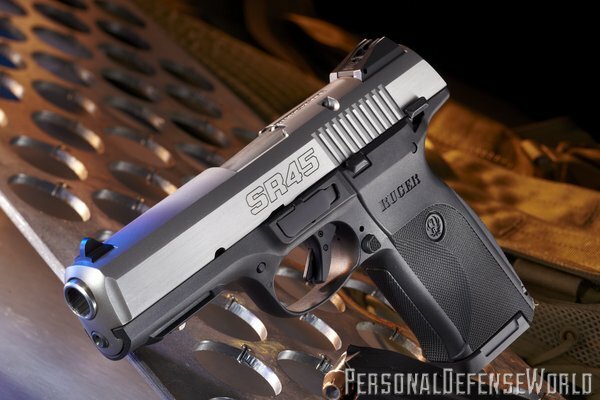 Ruger’s new striker-fired SR45 is full-sized and full of power, with a 10+1 capacity of big-bore .45 ACP ammo. With its ergonomic polymer frame, accessory rail, ambidextrous magazine release and thumb safeties, the SR45 is optimized for combat. The SR45 has an incredibly thin grip for its capacity, and the backstrap is reversible. The SR45’s high-profile loaded-chamber indicator signifies when a round is chambered. Also note the pistol’s large and robust external extractor. 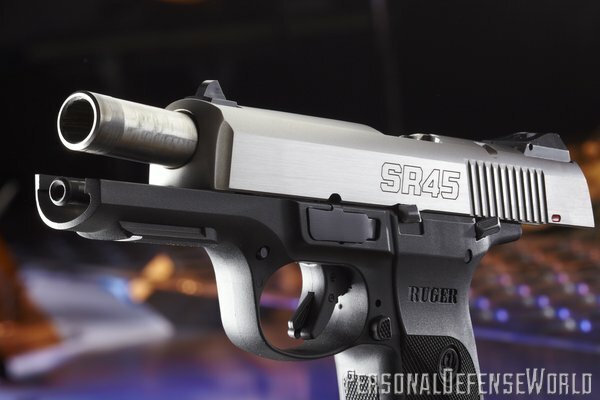 Ruger packed the SR45 with a 4.5-inch barrel and a full-length guide rod. The slide has high-visibility, three-dot sights and generous serrations for easier manipulations. The SR45 is all about safety—it has a magazine-disconnect safety, a firing-pin block, a thumb safety and a trigger safety (shown), which features a toggle that must be depressed to fire. Over the past 60-plus years, Sturm, Ruger & Co. has established an enviable reputation for manufacturing innovative, well-built pistols, rifles and shotguns. Founder Bill Ruger was known for building his guns tough, but he was also a gifted gun designer. 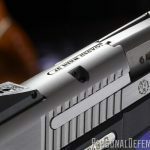 Carrying on that tradition, the company that Bill Ruger and Alexander Sturm founded continues to introduce new designs as well as regular improvements to existing guns. 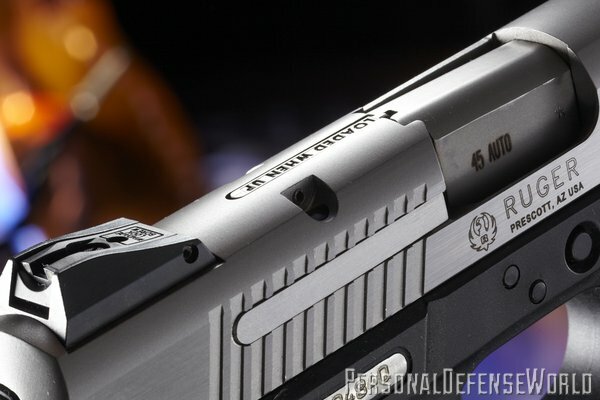 My first experience with Ruger handguns was not with the .22 LR Standard Mark I, the company’s very first gun, but rather with the 9mm P85, the company’s first semi-automatic, centerfire pistol. The P85 was built like a tank, and sort of looked like one with all of its angular surfaces. 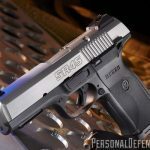 Today’s Ruger pistols have lost that tank look but not that tank-like toughness, and the new Ruger SR45 is no exception. Based on the SR series, which was originally introduced in 2007, the new SR45 is a polymer-framed, full-sized, striker-fired, recoil-operated, semi-automatic pistol chambered in the powerful .45 ACP cartridge and featuring a 10+1 capacity. 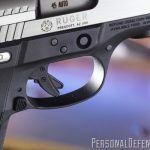 Ruger first developed its line of polymer (actually glass-filled nylon) frames to more easily reduce the dimensions of the pistol and make it lighter, slimmer and more convenient for lawful concealed carry. In this regard Ruger succeeded exponentially. 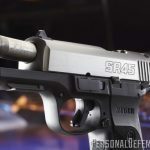 The grip on the SR45 is exceedingly thin, to the point that, in hand, it feels like a single-stack gun despite its 10-round, double-stack magazine packed with fat .45 ACP cartridges. The grip is also very well checkered on the sides and front and stays in the hand well. 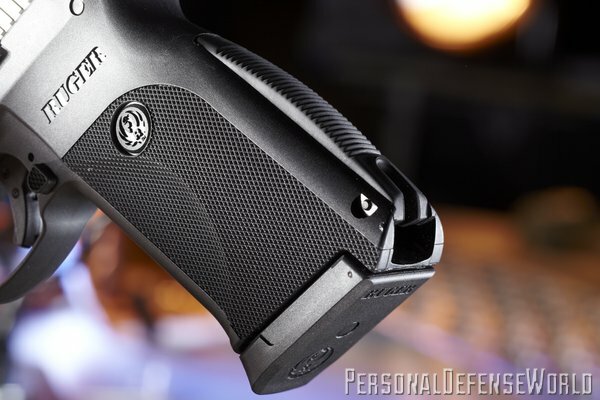 The grip sides feature Ruger’s distinct heraldic-phoenix logo. The grip’s backstrap has a rubberized insert that is removable and reversible. One side provides an arched profile; the other, a flat profile. While the SR45 is incredibly thin, I found it to be on the long side, front to back, even with my good-sized hands. The flat backstrap was much more comfortable for me, but it is certainly nice to have the option. The backstrap is held in place with a steel crosspin that serves double duty as an attachment point for a lanyard. The frame’s dust cover features an integral accessory rail for mounting lights or lasers, and the triggerguard is nicely oversized for comfortable gloved use. The magazine release is ambidextrous, as is the thumb safety, a feature that southpaws will appreciate. The small slide catch helps prevent accidental activation, especially when shooting with a firm two-handed grip. The pistol comes standard with two steel, 10-shot magazines with polymer followers and baseplates. The magazines include convenient witness holes to account for all 10 rounds. The baseplates feature a slightly extended finger rest and gripping grooves to make removal easier and faster, although the magazines do drop free under normal circumstances. A metal mag-loading tool is also included, but take note of the instructions since it works differently than most I have tried and requires manually loading the first round. The SR45 is certainly no pocket pistol, and the brushed and matte stainless steel slide seems massive. The gun’s also available with a black-nitride-finished slide. Atop the slide are steel, white three-dot sights that are dovetailed and drift-adjustable for windage. The rear sights can also be adjusted for elevation with an easy-to-use screw adjustment on top. A windage lock screw must be loosened to make drift adjustments, however. The front white dot is larger than the two rear white dots, which makes for easier front sight focus and sight alignment when speed is a concern. The rear of the slide features a good length of well-spaced and aggressive slide serrations for easier slide manipulation and operation, and the massive external extractor does a good job of pulling cases from the chamber, adding to the SR45’s reliability. The full-length captive guide rod, made of polymer, utilizes a single spring. At the range, it functioned flawlessly. As stated, this is a striker-fired pistol. When the action is cycled, the striker is partially charged. When the trigger is depressed, this completes the charging of the striker and then releases it. Once the striker is released, the trigger does not reset unless the action is again cycled, so there is no second-strike capability. At the rear of the slide, the back of the striker is visible when the mechanism is charged and ready to fire. The two-part striker itself is primarily steel, but the rear portion the shooter sees is actually polymer. When the trigger is depressed, the shooter can actually see the rear of the striker retract and then fall. Both internally and externally the Ruger SR45 has multiple safety features. The ambidextrous thumb safety locks the trigger and trigger bar, preventing any backward movement. The thumb safety clicks down to the “fire” position easily, but placing it in the on position requires a bit more effort. In my opinion, the thumb safety is unnecessary but meets certain state requirements and will offer many shooters some extra peace of mind. There is also a trigger safety in the form of a toggle on the face of the trigger. This toggle must be depressed and rotated out of the way for the trigger to be fully depressed. Internally, a firing-pin block works to stop the striker from moving forward unless the trigger is fully depressed. 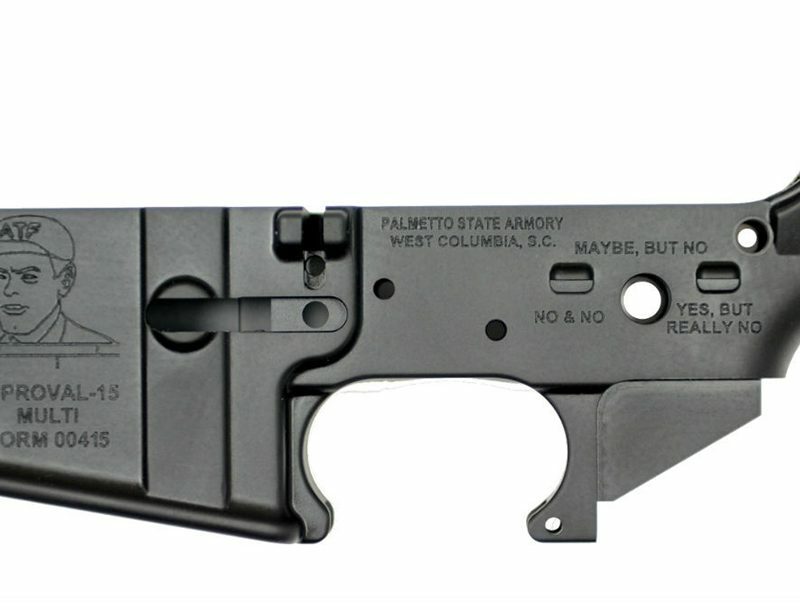 In addition, the SR45 has a magazine-disconnect safety, which means that the pistol cannot be fired with the magazine removed. Finally, the SR45 also features a loaded-chamber indicator, located at the top of the slide and the rear of the chamber. When there is a cartridge case in the chamber, this indicator protrudes conspicuously, is labeled “loaded when up” in capital letters, and has bright-red paint on both sides. It offers immediate visual and tactile indication from either side of the pistol that there is a cartridge case in the chamber. 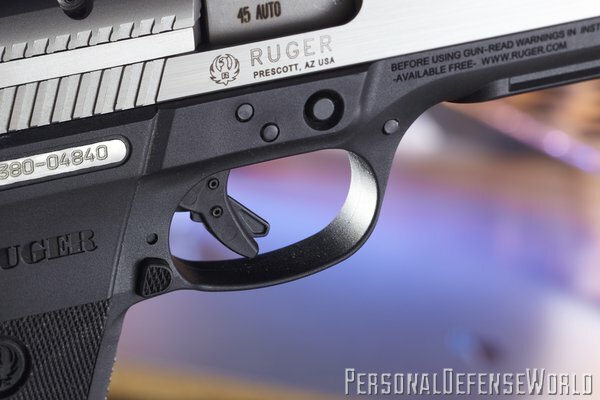 Ruger has certainly taken every step possible to make this pistol as safe as it can be. The magazine-disconnect safety does present an interesting dilemma that I had not previously encountered. At first it seemed odd that, during dry fire, the trigger squeeze felt gritty and heavy but was actually quite pleasant during live fire. I should have read the manual first as it clearly states that the pistol should only be dry-fired with an empty magazine inserted. 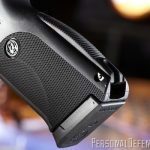 Dry-firing without the magazine in the gun increases the friction the striker experiences as it rides along the magazine-disconnect safety, producing a gritty feel. Dry-firing with the magazine inserted provides the proper feel for the trigger of actual live-firing. For carry options, Fobus makes a polymer, right-hand-only paddle holster for the SR45 that is available straight from Ruger. 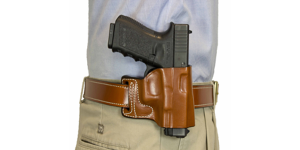 Gould & Goodrich also offers a minimalist leather belt holster, available in black or brown, that can clip on and off very easily. Maintenance on the SR45 is easily accomplished, and the pistol breaks down into its component parts quickly. Simply remove the magazine, ensure the pistol is unloaded, and lock the slide to the rear. Next, reach into the top of the open slide and push the ejector down, or the slide will not be able to go forward off the gun. Press the takedown pin on the right side of the gun, pull it out, and pull its baseplate from the other side. Ride the slide forward and squeeze the trigger to release the striker tension, and the slide will be free to go forward off the frame. The captive recoil spring and barrel are then easily removed from the slide for cleaning and maintenance. Assembly is in the reverse order, but make sure to return the ejector to its upward position. On the range the Ruger SR45 performed flawlessly. There were zero malfunctions experienced with the mix of hollow-point and ball ammunition used. Accuracy at 25 yards from a sandbag rest was very good and consistent, with an average five-shot group, across all types of ammo, measuring about 3 inches. Recoil was extremely manageable and pleasant off-hand but more pronounced from the bench. With all the pistol’s weight located on top, and with the ergonomic grip permitting a very high hold that places the shooter’s hand more in line with the barrel’s axis, the off-hand muzzle flip was a non-issue and it was easy to stay on target for faster follow-up shots. The trigger broke cleanly at a consistent 8 pounds but felt lighter than those with medium amounts of travel. The reset did require the trigger to move completely to its forward position, however. One of the brands of ammunition tested was Federal’s Guard Dog Home Defense load, which is designed as an FMJ on the outside but expands like a hollow point. Internally, this round features a special blue polymer, which is crushed by the front of the jacket when it hits its target and mushrooms nicely. This round also features low weight, higher velocity and lower recoil, which can be a great benefit to new or smaller-statured shooters, who may be recoil sensitive but still want a dependable self-defense round. The Ruger SR45 is a solidly built, tough-as-nails handgun with many safety features. Its design, size, low recoil and full-power loading will certainly appeal to those interested in personal protection inside the home. The SR45’s slim profile and relatively low weight also make it ideal for those who want a full-sized gun for concealed carry. For more information, visit ruger.com.